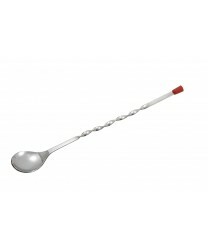 The Winco BPS-11 Bar Spoon with Red Knob, 11'' is designed for mixing alcoholic and non-alcoholic drinks. The extra-long handle of these bar spoons makes it possible to reach to the bottom of taller glasses, cups and pitchers, which yields a more consistent texture and flavor. These bar spoons have a decorative red plastic cover on the tip of the twisted handle.